Bryan/College Station, TX – October 24, 2018 – The Eleventh Annual BooFest at the Ballpark presented by H.E.B. is set for Sunday, October 28th, 2018. Last year over 3,000 people come through Bombers Stadium at Travis Field to attend BooFest. 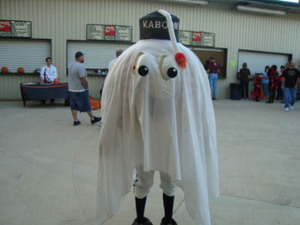 The Brazos Valley Bombers hosted event, which runs from 6-8:30 pm, is FREE and will include trick-or-treating, the Bombers inflatable Kidz Zone on the field, games, entertainment throughout the night, and a costume contest with a ton of prizes! A special thanks to our local H.E.B stores who have provided tremendous support and 500 pounds worth of candy to ensure the best possible BooFest for the Bryan/College Station community. The spook-tacular Halloween event will allow children to trick-or-treat at over 30 booths sponsored by local businesses from around the Brazos Valley. There will be countless activities for the kids to participate in, including games like Witch Hat Ring Toss, Ghost Bowling, Pumpkin Toss, face painting and a fall festive photo area! In addition to the activities, attendees will be able to satisfy their hunger at any one of the number of food trucks at BooFest, including Blakes Steaks, Pita Pit, The Crafty Pig, Kona Ice, Texas Sized Steak Kabobs, Abu Omar Halal, The Beef & Reef, and BBQ 13-0.